I've had this old frame for years. For a long time it hung near the front door where it was used as a post it place. Kids photos, artwork and notes were tacked or pinned onto the front of it. 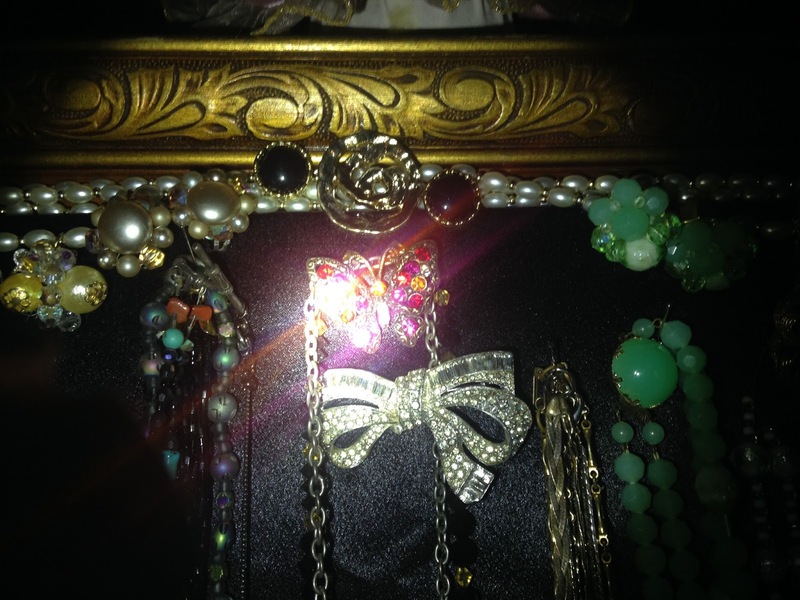 For as many years and longer, I struggled with a practical way to display the collection of costume jewelry that was amassing in every little box and bowl in my room. instead of stuffing them into one of my jewel boxes or bowls. For the large part otherwise, I had resolved to be happy with wearing two different earrings. did know that the system wasn't working for me. In an effort to organize my piles one afternoon, I moved the large frame that had been stripped of the photos and notes it once held and delegated to the floor, where it sat for several months, before being motivated to get organized on this particular day prompted me to pick it up. 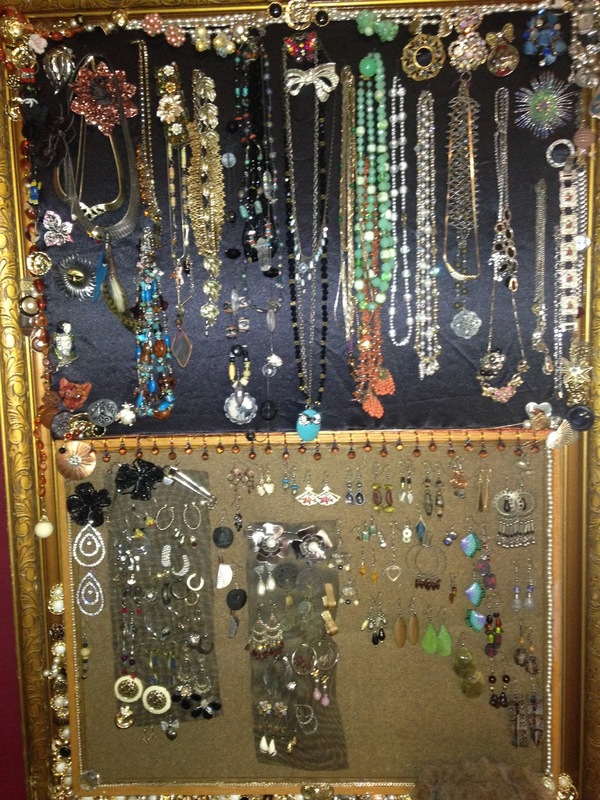 It finally occurred to me what a great Jewelry Display the frame would be. in the closet, I put it up on my work table. 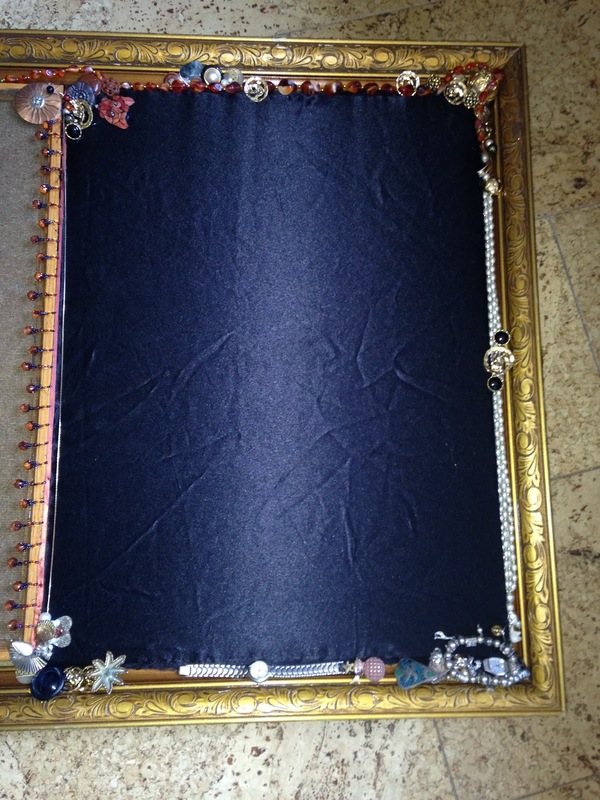 I began the transformation by hot gluing a framed cork board to the lower front portion of the frame. To the front of the cork board, I then hot glued a black piece of screen window mesh that I had laying around. Many years ago I had first used the mesh in the production of funky, fashionable earrings. 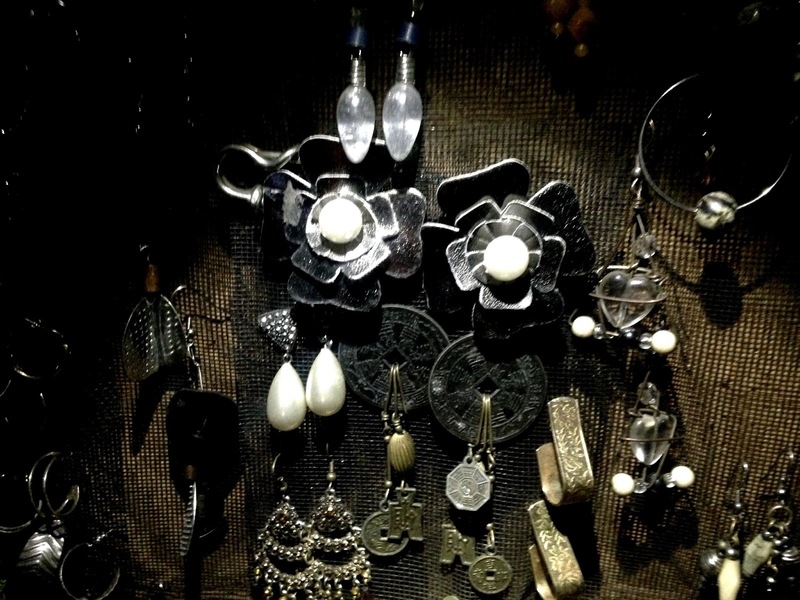 It would now work perfectly for hanging earrings. 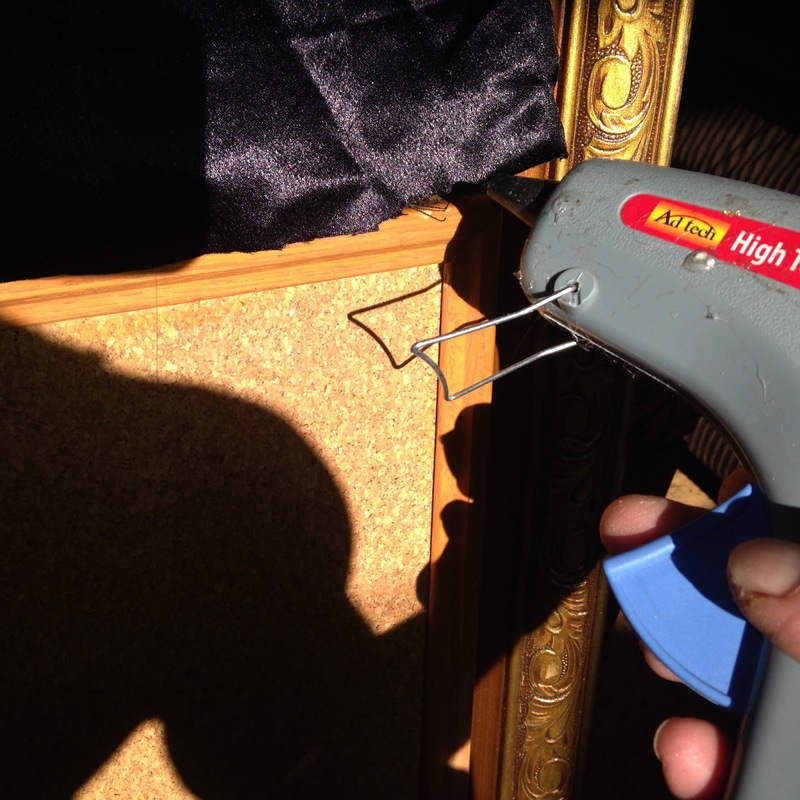 To the top portion of the frame I hot glued a piece of black silk fabric. I had first folded back the edges to avoid any fabric fraying. The Black would serve as a wonderful back drop for the jewels I would pin onto it. This photo is sideways. The black fabric area is at the top of the frame. The cork board is glued below the fabric. as well as to finish the outer edges of the black silk area . with a broken string of fake pearls and the three round buttons. were covered and filled in with an assortment of buttons and broken jewel bits. 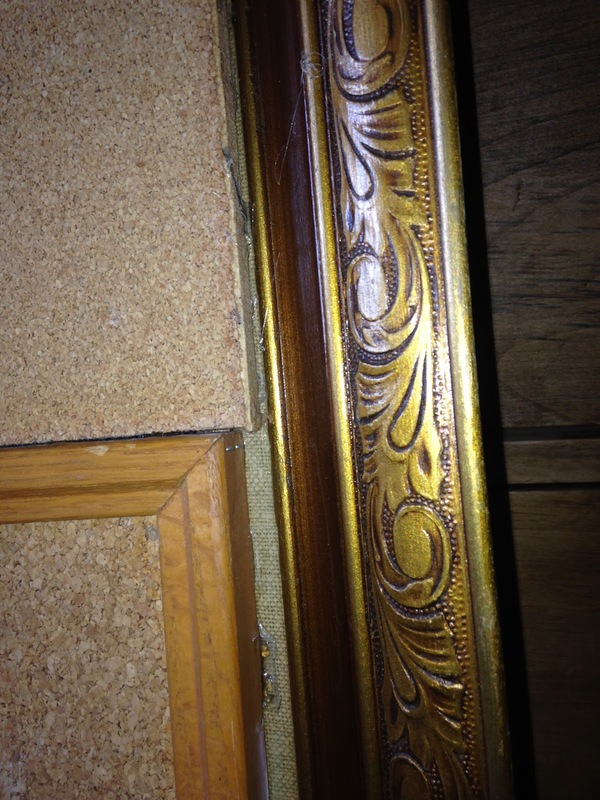 A thin broken chain was hot glued to the inside edge of the cork board frame itself. 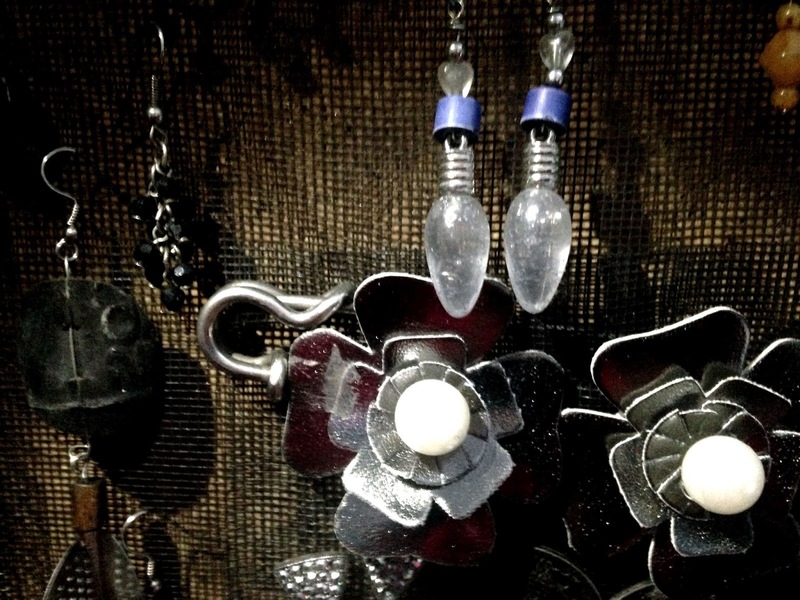 Earrings with a hook can be easily slid into a mesh hole and hung. to secure the earring backs. As seen at bottom here. several of which were used to secure a separate piece of mesh over the first layer of mesh. This allows me to lift the mesh and secure the earring back. 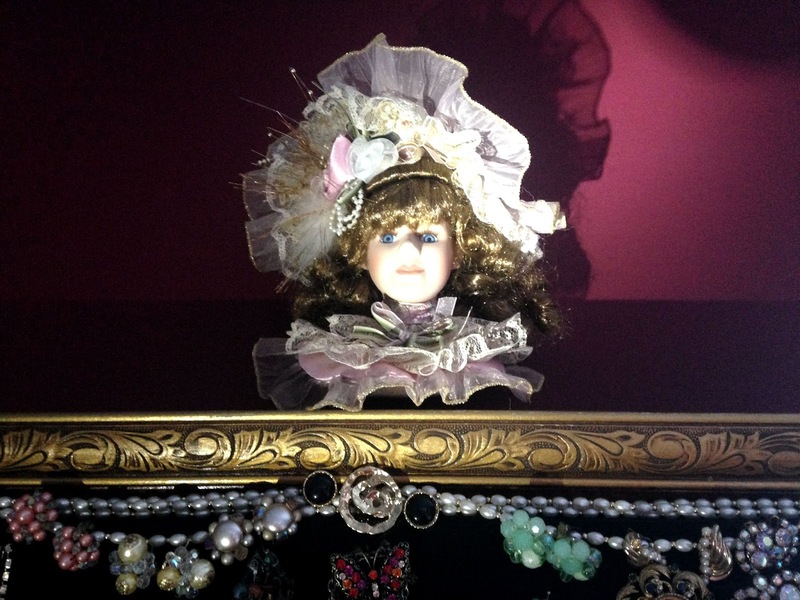 I used a sewing strait pin to hold this lovely ladies head to the wall. 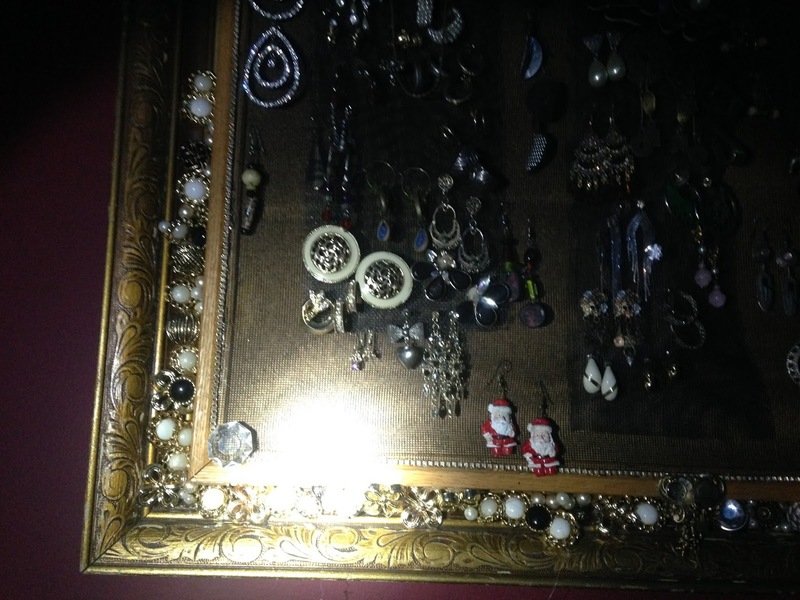 It is pinned so that it sits on the lip of the framed Jewelry display. I am thrilled with the over all appearance and ecstatic about the practicality of the project. Now at a glance, I am able to select the piece of jewelry that I chose to adorn myself with. My jewelry no longer lays lost and forgotten in containers. I can now appreciate the beauty of my collection, after all that is why I collect it.